Boardman…Funeral services will be held Thursday, Jan. 24, 2019, at 12:00 p.m. at the Wasko Funeral Home, followed by a Mass of Christian Burial at 12:30 p.m. at Christ the Good Shepherd Parish at St. Joseph the Provider Catholic Church, for Irene Torok Grizinski, 98, who passed away Sunday, January 20, 2019, with her family by her side. Irene was born May 16, 1920, in Campbell, the daughter of Frank and Elizabeth Jursa Torok. She graduated from Campbell Memorial High School in 1938 and later moved to Boardman in 1952. She was a parishioner of St. Joseph the Provider Parish in Campbell. Irene was a member of United Steelworkers of America, Local 1418 Senior Citizen’s Group, and AARP. She enjoyed yardwork, baking, and discussing current events. 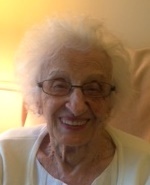 Above all, she loved spending time with her grandchildren and great-grandchildren. Irene’s husband, Joseph Grizinski, whom she married October 20, 1950, passed away July 14, 1986. Irene will be deeply missed and always remembered by her children Lizbeth Baynes (Timothy) of Boardman, Richard Grizinski (Catherine) also of Boardman, and Barbara Turkal of North Lima; her grandchildren, Amy Baynes Horning (Josh) of Leo, Indiana, Brian Baynes (Angie) of Columbus, Mark Baynes (Sarah) of Howland, and Jessica Grizinski of Lowellville; great grandchildren, Ryan, Gwen, Maura, Logan, Alex and Caeden. She was preceded in death by her parents; and her brothers, Frank and Paul Torok. Irene’s family would like to thank the staff of the Hospice House for their special care. The Grizinski family has entrusted their loved one to the care of the Wasko Funeral Home and will receive family and friends Thursday, Jan. 24, 2019 from 10-12:00 p.m. at the funeral home. The family requests memorial contributions be made to Hospice of the Valley in Irene’s name.